• Taking all the slate off the top of the pots, so the air could get to the surface and aide the drying process. • Checking for any fallen flower stems. • Checking for any dropped leaves. • Treating or cutting out any bits of stem rot that I see. I am beginning to see sporadic outbreaks of Mildew, but I quickly spray and treat any outbreaks with Fungus Ultra Clear. A quarter of my cuttings are still outside, and they were given a good watering that contained ¼ strength feed Chempak 4. All my other cuttings in the greenhouses and are still being watered and fed as above. ...Vincent Potts asked me a couple of months ago if I fancied a drive to the final East Anglia meeting of the year, I had to say yes as I had not seen Alan Harris, John Taylor and Dave Staines for couple of years now. So this morning Vincent dropped his car off at my house and the pair off us set off via the M62 to the A1. Then we followed the A1 south straight down the A1 heading to Stamford and the junction for the A6121. From there it’s only about 5 minutes across on A6121 to the Castle Cement Works at Ketton were they hold their meetings. On arrival we met Dave Staines in the car park and had a quick chat with him, before Andrew McDougall arrived and Vincent went over for a chat about a mysterious “dodgy” looking species plant that he had in the boot of his car. As it happened x3 leaves from this plant actually ended up coming back with us. By now I had caught sight of my old friend Alan Harris and we had a good 5 minutes nattering and catching up on things before Vincent joined us along with Geoff Keer and further conversations followed. Inside I sat towards the back of the hall out of the way with Vincent, Geoff Keer joined us and next to Geoff sat Neville Janik. I met Neville Janik for the first time earlier this year at Bellcross Nurseries Open Day, but today was the first time we actually had a good chat, we discussed many things with regards our hobby / obsession and Neville showed us some impressive pictures of the flowers in his greenhouse. There was no speaker as such booked for this meeting as John Taylor was stepping down as Area Representative due to ill health and they were looking for someone to step into the big shoes left by him. The meeting finished with still no rep. being appointed, and we left the East Anglian Area in a “state of Flux” as far as I am concerned. As we were coming out of the meeting I ran into Christine Yeardley and we had a quick chat to catch up on things. After saying our goodbyes we set off home at approx. 17:00pm, we arrived back at mine for just gone 18:45hrs. It had taken about 1.45hrs to get home, it had felt like I was possessed by the spirit of a certain gentleman from Kirkcudbright on the drive home. • Took all the slate of the top of the pots. • Checked for any fallen flower stems. • Checked for any dropped leaves. • Treated or cut out any bits of stem rot that I saw. Then checked, watered and fed the cuttings I had in there. The last of my cuttings that I had outside have been brought in today for the following reason. At the start of this week it has been as though someone has flicked a switch and all the leaves on the trees have turned colour and more or less fallen off. So there has been an obvious shift in the seasons and the weather. • Any fallen debris from their surroundings. • Slugs resting on the surface of the compost. • Snails hiding under the leaves (I find the little sods have a habit of defying gravity). Then they were all sprayed with Fungus Clear Ultra to prevent any change of the advancement of mildew. • Taking fallen “debris” off. • Cutting any rotting parts back to clean growth, and dust with normal yellow sulphur. • Taking the plastic cane out of each pot. • The “artificial raffia” that I tied the plant or flower to the cane with I untied, for it to be re-used again next year. • Now if the plant had dried out enough, resulting in the “root ball” coming away from the sides of the pot I cut the plant back by a 1/3rd. • That some stems just came away from below the soil line (see picture to right). Now after a good 5 hours the greenhouse looks different, as you can see by the picture to the left. Now it was the turn of my second greenhouse. The picture to the left shows what my plants looked like after I went through them all doing the same as above. Stick with this one it will make sense at the end, well I hope it does – it took me a while to understand it fully myself and try and put it into words to explain it. I have heard the word “Conductivity” with regards the plant on more than one occasion this year so I decided to have a look into this subject and try and explain it for those of you like me who did not fully understand what it actually meant or impact it could have on your plant. I have found out that there are actually x3 things that all work together. How does - Electrical Conductivity, Salinity and pH - affect the growth of a plant?? Solids can be found in nature in a dissolved form. Salts that dissolve in water break into positively and negatively charged ions. Conductivity is the ability of water to conduct an electrical current, and the dissolved ions are the conductors. Plant nutrients exist in the soil as either anions or cations. These ions that are dissolved in the soil water carry an electrical charge. • Now you may be wondering about Carbon & Oxygen, but the plant gets these from the Air. • And Hydrogen from Water. Now the important part! 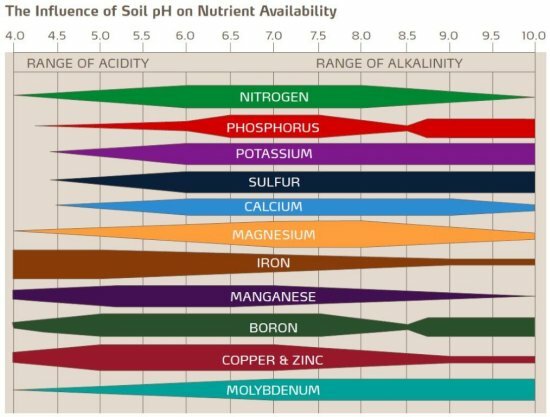 Since soils are negatively changed and plant nutrients are positive or negative, some nutrients are attracted to soil while others are not – just like the old saying says “opposites attract”. Those nutrients that exist as anions (-) readily travel wherever water carries them. Cations (+) are more readily bound to the soil, resulting in these nutrients moving through the soil more slowly. Soil chemical activity is related to particle size. Small particles like humus and clay are the most important sites from which nutrients are taken up by plants. Clay and humus are negatively charged, and many nutrients are positively charged. The clay and humus hold these positively charged ions, preventing them from being leached out of range of the plant roots. Negatively charged ions are held in the “soils water”, and are susceptible to leaching downwards and out of reach of the roots. This is why we have the issues with Phosphates & nitrates leaching away. 1. EC Probe (easiest way) – once you have EC probed your sample, you can test it at the same time for the pH reading as well. The EC conductivity it is measured in dS/m or deciSiemens per meter. 2. EC Method – Is a standard accepted laboratory method for EC testing using the saturated paste “extract” from your medium. The electrical conductivity of water is actually a measure of salinity (The measure of all salts dissolved in water). A plants sensitivity to salt is highly variable as some are very sensitive and others are very tolerant of salt. Plants are detrimentally affected, both physically chemically by access salt. The more salt in the water, reduces its water potential making it less available to the plant. • High EC value indicates a high electrical conductivity resulting in a high salt content. • Slow or no growth. • Burning and dieback of young growth. • Dead and brown sections on the margins and tips of older leaves. With a high salt concentration it is actually possible for us to create conditions where the roots are no longer able to take any more water up from your “medium”. This is known as “physiologically dry”. The result is that no more water is available for the plants to cool themselves down through transpiration (evaporation). Even though this effect is commonly referred to as “over fertilization”, it is actually the result of a shortage of water in the plant, with all the damaging effects that go with it. With a low salt concentration this could indicate that the plant needs additional nutrients. Please also be aware if your medium dries up the nutrient (salt) content increases and might reach the point where it will damage the root. • It measures the acidity or alkalinity in a solution. Did you know that pH stands for the “power of hydrogen” (if I am honest I never), and the numerical value of pH is determined by the molar concentration of hydrogen ions (H+)3. Approximately 20 macronutrients and micronutrients are deemed essential nutrients to support all the needs of a plant. 1. A plant cannot complete its life cycle without the element. 2. No other element can perform the function of the element. 3. The element is directly involved in the plant nutrition. • They also tend to be less available in “mediums” with a low pH. • Iron (Fe), Manganese (Mn), Boron (B), Molybdenum (Mo), Copper (Cu), Zinc (Zn), Chlorine (Cl), Nickel (Ni), Cobalt (Co), Sodium (Na) & Silicon (Si). • They also tend to less available in “mediums” with a neutral to high Ph. To emphasis my point more clearly please see the picture to the left. 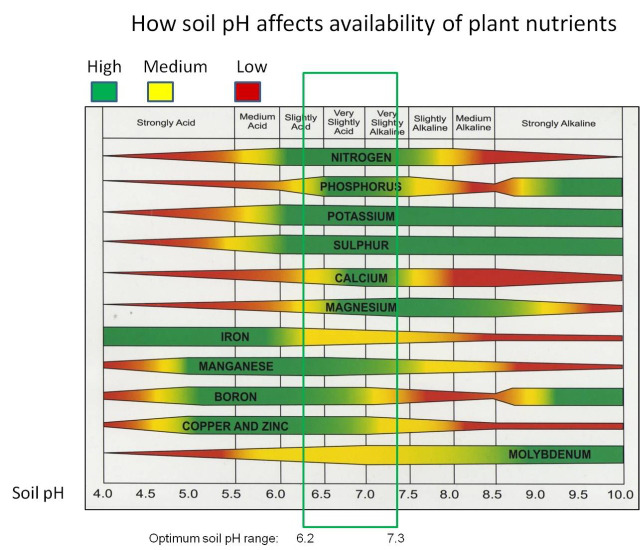 The ideal pH for our plant of choice is arguably pH 6.0 to 6.5, at this point microbial growth is also at its maximum. 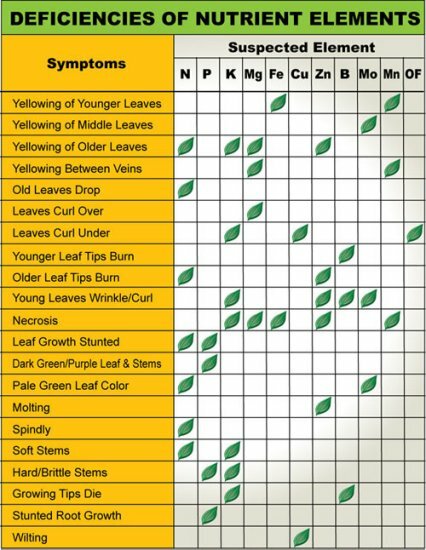 Now if your pH is “off” it will lead to nutrient deficiencies – now just to touch on this issue very quickly please see the “picture chart” to the right hand side, this will give you a quick idea of problems you can face and the nutrient shortage that could be the problem (please see above to see which nutrient the chemical symbol relates to). So there you have it – we knew a lot about the actual plant but how many of us know how the “environment” around the root system actually works. Hopefully I have made some of you out there a little wiser along with myself – and hopefully not any older. Now for the last word - after this Educational Journey my head is cabbaged, I need a dark room to lie down and recover. When we stopped at John Hamilton’s on the way to Ronnie Welsh’s and the Fifth Flower Show one of the topics of conversation was about Vine Weevils. We were discussing how much it now costs to dose all your plants with Provado when John mentioned Nematodes, and we started saying that they don’t work below 10°c or 50°f! But John then informed us that you can get Nematodes that work down to 5°c or 41°f!!! On checking one popular brand on the web, there it was – apply when soil temperature is above 5°c (41°c) – the man from Coalburn was right. So next year my plants are getting treated with nematodes throughout the year as it will save me a lot of money with regards the chemical ones I usually use, when everything is going up in price it is nice to find a cheaper alternative that works.